Links to resources: What I really should say here is, “No resources! Just go play!” But here are some resources that are also playing 🙂 Coloring Page, and for activities, try making a daisy crown (or any kind of outdoorsy crown), or make clouds out of cotton or shaving cream and see what shapes you see in them, or build a fort out of sticks, or blocks, or an empty cardboard box. Use you imagination! And now, the moment you’ve all been waiting for, when I announce… that I will be vacuuming this afternoon! Nah! I’m just foolin’ with ya! The winner of a Michael Garland book is none other than our delightful Robyn!!! Wahoo! Yay Robyn! (From Tuesday Jan. 24): Clarbojahn’s Blog: Part 2 of our interview and a giveaway of a hard cover copy of Punxsutawney Phyllis. (From Thurs. Jan. 26): Corey Schwartz’s Blog, Thing 1 and Thing 2. This one is all about where the idea for Phyllis came from and will be in two parts. I’m not sure yet when part 2 will be. Friday Jan. 27: Leigh Covington’s Blog. This one is a (brief!) interview with Phyllis herself! She emerged from her burrow just because she likes Leigh. There will be a giveaway of a hard cover copy of Punxsutawney Phyllis here too! Sat. Jan. 28: Iza Trapani’s Blog, In And Out Of My Studio. A chat with one of my favorite author/illustrators who may or may not be appearing on this blog soon (I could tell you, but then it wouldn’t be a secret :)) There will be a giveaway of a hardcover copy of Punxsutawney Phyllis on this one, too! Perfect Picture Book bloggers, please remember to post your links in the list below so everyone can come see the wonderful books you’ve chosen this week! Pitch Pick # 5 AND Oh Susanna: How Do You FInd And Pay For Illustrators? 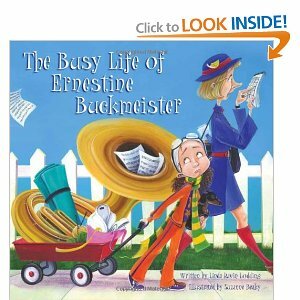 I have a friend whose daughter's name is Bernadette and she calls her Bern – not far from Ern – and this book could be about her! You should see it, Leigh! It's impressive! That sounds like a GREAT book! Maybe more important for some parents to read, than their kids 🙂 You see a lot of that “must fill my kid's day, every day” mentality. I personally think free-play is extremely valuable.